In the Eastern Orthodox Church a saint is defined as anyone who is in Heaven, whether recognized here on earth, or not. By this definition, Adam and Eve, Moses, the various prophets, except for the angels and archangels are all given the title of "Saint". Sainthood in the Syriac Orthodox Church does not necessarily reflect a moral model, but the communion with God: there are countless examples of people who lived in great sin and became saints by humility and repentance, such as Mary of Egypt,Moses the Ethiopian, and of course Dysmas, the repentant thief who was crucified. Therefore, a more complete definition of what a saint is, has to do with the way that saints, through their humility and their love of humankind, saved inside them the entire Church, and loved all people. Syriac Orthodox belief considers that God reveals his saints through answered prayers and other miracles. Saints are usually recognized by a local community, often by people who directly knew them. As their popularity grows they are often then recognized by the entire church. The formal process of recognition involves deliberation by a synod of bishops.If successful, this is followed by a service of Glorification in which the Saint is given a day on the church calendar to be celebrated by the entire church This does not, however, make the person a saint; the person already was a saint, and the Church ultimately recognized it. It is believed that one of the ways the holiness (sanctity) of a person is revealed, is through the condition of their relics (remains).In some Orthodox countries (such as Greece, but not in Russia) graves are often reused after 3 to 5 years because of limited space. Bones are washed and placed in an ossuary, often with the person's name written on the skull. Occasionally when a body is exhumed something miraculous is reported as having occurred; exhumed bones are claimed to have given off a fragrance, like flowers, or a body is reported as having remained free of decay, despite not having been embalmed (traditionally the Orthodox do not embalm the dead) and having been buried for some years in the earth. The reason relics are considered sacred is because, for the Orthodox, the separation of body and soul is unnatural. Body and soul both comprise the person, and in the end, body and soul will be reunited; therefore, the body of a saint shares in the “Holiness” of the soul of the saint. As a general rule only clergy will touch relics in order to move them or carry them in procession, however, in veneration the faithful will kiss the relic to show love and respect toward the saint. Every altar in every Orthodox church contains relics, usually of martyrs. Church interiors are covered with the Icons of saints. Because the Church shows no true distinction between the living and the dead (the saints are considered to be alive in Heaven), saints are referred to as if they were still alive. Saints are venerated but not worshipped. They are believed to be able to intercede for salvation and help mankind either through direct communion with God, or by personal intervention. "Henceforth all generations shall call me blessed." Luke. 1:48 "Blessed art thou amongst women." (Elizabeth) A certain woman cried :Blessed is the womb that carried Thee and the paps that fed thee." The Apostles had a deep veneration towards the Mother of God. Tradition says that St. Mark's house was made the first church in Christendom and that, in the name of St. Mary. A parchment with signatures of all the Apostles and 72 preachers, in which it was said that the Holy Mother passed away in 63 AD and that three times a year, the commemoration of the Holy Mother be observed was found in the possession of St. John at Ephesus. Maryam, more commonly referred to as Saint Mary, Mother Mary, or (Blessed) Virgin Mary, was a Jewish woman of Nazareth in Galilee. She is identified in the New Testament as the mother of Jesus Christ through divine intervention. 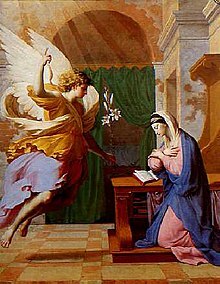 The New Testament begins its account of Mary's life with the Annunciation, when the angel Gabriel appeared to her and announced her divine selection to be a mother of Jesus. Church tradition and early non-biblical writings state that her parents were an elderly couple, Saint Joachim and Saint Anne. The Bible records Mary's role in key events of the life of Jesus from his conception to his Ascension. The New Testament account of her humility and obedience to the message of God have made her an exemplar for all ages of Christians. Out of the details supplied in the New Testament by the Gospels about the maid of Galilee, Christian piety and theology have constructed a picture of Mary that fulfills the prediction ascribed to her in the Magnificat (Luke 1:48): "Henceforth all generations will call me blessed." Tradition has it that the Apostle of our Lord landed at Muziria (Cranganore) in 52 AD and preached the Gospel to the Jews and to others and converted many to Christianity. He is believed to have founded seven Churches in Cranganore, Palur, Kottakavil, Gokamangalam, Kurakeni, Kollam and Chayal and ordained priests from four converted Brahmin families namely Kalli, Kalikavu, Shankarapuri and Pakalomotttom. This tradition has been handed down from generations to generations through ancient songs such as Veeradiyan Pattu, Margomkalipattu, Rembanpattu etc. It is worth noting that no other place in the whole Christendom, claims theApolostic Mission of St. Thomas. St.Thomas the Apostle, also called Doubting Thomas or Didymus (meaning "Twin") was one of the Twelve Apostles of Jesus. He is best known for disbelieving Jesus' resurrection when first told of it, then proclaiming "My Lord and my God" on seeing Jesus in St.John 20:28. He was perhaps the only Apostle who went outside the Roman Empire to preach the Gospel. He is also believed to have crossed the largest area, which includes the Parthian Empire and India. St.Thomas is revered as a saint by the Syriac Orthodox Church, the Roman Catholic Church, the Eastern Orthodox Churches, the Oriental Orthodox Churches, the Anglican Communion, the Lutheran Church, and the Church of the East. According to The Passing of Mary, a text attributed to Joseph of Arimathaea. St. Thomas was the only witness of the Assumption of St.Mary into heaven. The other Apostles were miraculously transported to Jerusalem to witness her death. St.Thomas was left in India, but after her burial he was transported to her tomb, where he witnessed her bodily assumption into heaven, from which she dropped her girdle. In an inversion of the story of St.Thomas' doubts, the other apostles are skeptical of St.Thomas' story until they see the empty tomb and the girdle.St. Thomas' receipt of the girdle is commonly depicted in medieval and pre-Tridentine Renaissance art. St.Thomas next proceeded overland to the Coromandel coast and ministered in what is now the Chennai (Madras) area, where a local king and many people were converted. One tradition related that he went from there to China via Malacca and, after spending some time there, returned to the Madras area (Breviary of the Mar Thoma Church in Malabar). Apparently his renewed ministry outraged the Brahmins, who were fearful lest Christianity undermined their social structure, based on the caste system. So according to the Syriac version of the Acts of St.Thomas, Masdai, the local king at Mylapore, after questioning the Apostle condemned him to death about the year AD. 72. Anxious to avoid popular excitement, “for many had believed in our Lord, including some of the nobles,”the king ordered St.Thomas conducted to a nearby mountain, where, after being allowed to pray, he was then stoned and stabbed to death with a lance wielded by an angry Brahmin. A number of Christians were also persecuted at the same time; when they refused to apostatize, their property was confiscated, so some sixty-four families eventually fled to Malabar and joined that Christian community. St.John the Baptist was a historical figure mentioned in each of the Canonical gospels, Aramaic Matthew and by the Jewish historian Josephus. He followed the example of previous Hebrew prophets, living austerely, challenging sinful rulers, calling for repentance, and promising God's justice. All four Gospels record St.John the Baptist's ministry. They depict him as proclaiming Christ's arrival. In the Synoptic Gospels (St.Mark, St.Matthew, and St.Luke), Jesus is baptized. In St.Matthew and St.John, St.John the Baptist recognizes Jesus as the one he had foretold. The Gospel of St.Luke includes an account of John's infancy, introducing him as the son of Zachariah, an old man, and his wife Elizabeth, who was sterile. According to this account the birth of St.John the Baptist was foretold by the angel Gabriel to Zachariah, while Zachariah was performing his functions as a priest in the temple of Jerusalem; since Zachariah is described as a priest of the course of Abijah, and his wife, Elizabeth, as one of the daughters of Aaron this would make John a descendant of Aaron on both his father's and mother's side. St.Peter was one of Twelve Apostles, chosen by Jesus from his first disciples. He was a fisherman assigned a leadership role by Jesus and was with Jesus during events witnessed by only a few Apostles, such as the Transfiguration. St.Peter worked to establish the church of Antioch for seven years and presided as the city's bishop. He preached to scattered communities of believers (Jews and Hebrew Christians), in Pontus, Galatia, Cappadocia, Asia Minor and Bithynia, and went to Rome. In the second year of Claudius, he overthrew Simon Magus, and held the Sacerdotal Chair for 25 years. He was crucified with his head down and martyred during Nero's reign.o death. St. Paul was a zealous Jew, who persecuted the early followers of Jesus Christ. However after his "Resurrection experience", he became a Christian and referred to himself as the "Apostle to the Gentiles". According to the Acts of the Apostles, St. Paul's conversion to faith in Jesus took place in a profound life-changing experience on the road to Damascus. Together with Simon Peter and James the Just, he is considered among the most notable of early Christian leaders.He was also a Roman citizen—a fact that afforded him a privileged legal status with respect to laws, property, and governance. Thirteen epistles, or letters, in the New Testament are attributed to St. Paul. His influence on Christian thinking arguably has been more significant than any other New Testament author. St. Paul's conversion dramatically changed the course of his life. Through his missionary activity and writings he eventually transformed religious belief and philosophy throughout the Mediterranean basin. St.Paul's leadership, influence and legacy led to the formation of communities dominated by Gentile groups that worshipped the God of Israel, adhered to the Judaic "moral code" but relaxed or abandoned the "ritual" and dietary obligations of the Mosaic law all on the basis of the life and works of Jesus Christ and the New Covenant established through Jesus' death and resurrection. These communities eventually formed Christianity, in the split of early Christianity and Rabbinic Judaism following the destruction of the Temple at Jerusalem. St. John was one of the Twelve Apostles of Jesus. He was the son of Zebedee and Salome, and brother of St.James, another of the Twelve Apostles. Christian tradition holds he was the last surviving of the Twelve Apostles and died around the age of 94—the only apostle to die naturally. The Church Fathers identify him as the author of several New Testament works: the Gospel of St.John, the Epistles of St.John, and the Book of Revelation. The Eastern Orthodox tradition gives his mother's name as Salome. They originally were fishermen and fished with their father in the Lake of Genesareth. He was first a disciple of St.John the Baptist and later one of the twelve Apostles of Jesus. St.John held a prominent position in the Apostolic body. St. Peter, St.James and St.John were the only witnesses of the raising of Jairus' daughter of the Transfiguration and of the Agony in Gethsemane. Only he and St.Peter were sent into the city to make the preparation for the final Passover meal (the Last Supper). At the meal itself, his place has been next to Jesus on whose chest he leaned if he is indeed the "disciple whom Jesus loved." According to the general interpretation, St.John was also that "other disciple" who with St.Peter followed Jesus after the arrest into the palace of the high-priest.St. John alone remained near Jesus at the foot of the cross on Calvary with Jesus’ mother, St.Mary, and the pious women and took St.Mary, Mother of God into his care. According to the Bible, after the Resurrection, St.John and St.Peter were the first of the disciples to run towards the tomb and St.John was the first of the apostles to believe that Jesus had truly risen. The author of the Gospel of John was accustomed to identifying himself as "the disciple whom Jesus loved". After Jesus’ Ascension and the descent of the Holy Spirit on Pentecost, St.John, together with St.Peter, took a prominent part in the founding and guidance of the church. He is with St.Peter at the healing of the lame man in the Temple. With St.Peter he is also thrown into prison. He is also with St.Peter visiting the newly converted in Samaria. St. George born on 23 April 303 was, according to tradition, a Roman soldier and a priest in the Guard of Diocletian, who is venerated as a Christian martyr. In hagiography Saint George is one of the most venerated saints in the Catholic (Western and Eastern Rites), Anglican, Eastern Orthodox, and the Oriental Orthodox churches. He is immortalized in the tale of Saint George and the Dragon and is one of the Fourteen Holy Helpers. His memorial is celebrated on 23 April, and he is regarded as one of the most prominent military saints. The episode of St George and the Dragon was a legend brought back with the Crusaders and retold with the courtly appurtenances belonging to the genre of Romance. The earliest known depiction of the legend is from early eleventh-century Cappadocia, (in the iconography of the Eastern Orthodox Church, St.George had been depicted as a soldier since at least the seventh century); the earliest known surviving narrative text is an eleventh-century Georgian text. lost his father; a few years later, George's mother, Polychronia, died. Eastern accounts give the names of his parents as Anastasius and Theobaste. In the year AD 302, Diocletian (influenced by Galerius) issued an edict that every Christian soldier in the army should be arrested and every other soldier should offer a sacrifice to the Pagan gods. in martyrdom. His body was returned to Lydda for burial, where Christians soon came to honour him as a martyr.